Minimally Invasive Spine Surgeon - Greg S. Khounganian, M.D. 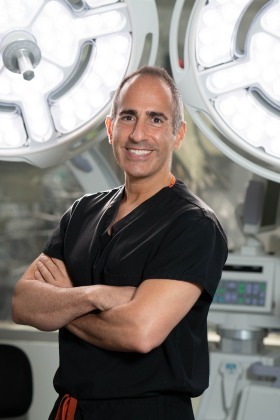 Dr. Greg Khounganian is board certified in spine surgery that emphasizes minimally invasive techniques. After earning his medical degree from the University of Southern California, he completed his orthopedics surgery residency in New York City. As he grew adept at treating a variety of orthopedic problems, ranging from sports injuries to broken bones to arthritic joint conditions, Dr. Khounganian developed an interest in spine and spine-related disorders. He returned to his home in the San Fernando Valley to expand on his spine surgery training with a fellowship at the Southern California Orthopedic Institute. Here Dr. Khounganian learned some of the most innovative orthopedic techniques available to patients, including treating spine conditions with non-operative techniques and utilizing microscopic and other minimally invasive procedures. His use of these state-of-the-art practices means patients can return to their regular activities as quickly as possible. Customizing his approach to match each patient's specific needs, Dr. Khounganian performs procedures involving the cervical, thoracic, and lumbar spine. His extensive list of procedures includes: cervical discectomy and fusion, cervical arthroplasty, lumbar microdiscectomy, lumbar decompression, and fusion procedures. Dr. Khounganian has participated in a number of orthopedic research projects and been published in a range of academic journals. His research has been accepted for presentation at both national and international spine surgery meetings. During his medical education, he was awarded recognition for his outstanding scholastic achievements. In his free time, he enjoys music, movies, personal fitness, and outdoor activities with friends and family. To learn more about Dr. Khounganian and the services provided at his Encino office, please email or call us today at 818.343.4430 to schedule an appointment. Valencia, Westlake Village, Granada Hills, Northridge, and the surrounding SFV and Los Angeles areas.